The various technologies that make up the many kinds of power-giving fuel cell have all been around for years and we’re constantly being told that commercial applications are imminent, yet somehow nothing has arrived yet. The latest devices to see the light of day are from Toshiba. The company’s DMFC (Direct Methanol Fuel Cell) has been seen before in other prototype devices, so it makes a change for it to appear powering a real mobile phone as a battery substitute. The company also showed an external DMFC charger for powering up any device via USB. Toshiba says both could be available within a year. 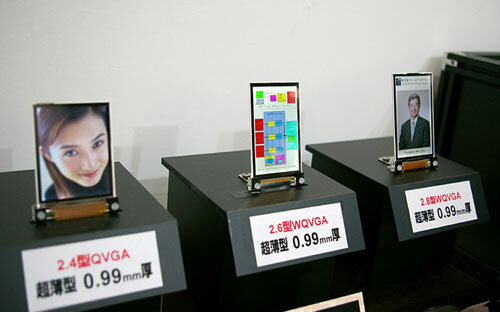 As well as the DMFC gear, Toshiba displayed some very thin screens it has developed with Matsushita for use in phones and similar devices. These range from 2.4 to 2.8in and are just 0.99mm thick. Given the current trend towards touch-sensitivity in larger-screened devices, it’s clearly only a matter of time before even smaller phones and PDAs sport the technology. Toshiba Matsushita hasn’t specified a date for mass production.